Making maki and nigiri sushi with brown rice is a bit more difficult than using white sushi rice because brown rice has a lower starch content. If you're not concerned about getting more nutrients in your rice and you've never made sushi rolls before, then I definitely recommend that you purchase Japanese sushi rice and follow the directions on the package for cooking. I used two cups of short grain brown rice and added a little additional water and over cooked it until all the water was absorbed to bring out the starch. After the rice was cooked, I then added 1/3 cup rice vinegar and two tablespoons agave nectar and then let the rice cool to room temperature before using. You can use whatever vegetables you like for the filling for the maki rolls. I used finely sliced cucumber, carrots, zucchini, red bell pepper, avocado and baked tofu. I also used toasted white and black sesame seeds and broccoli sprouts for garnish. 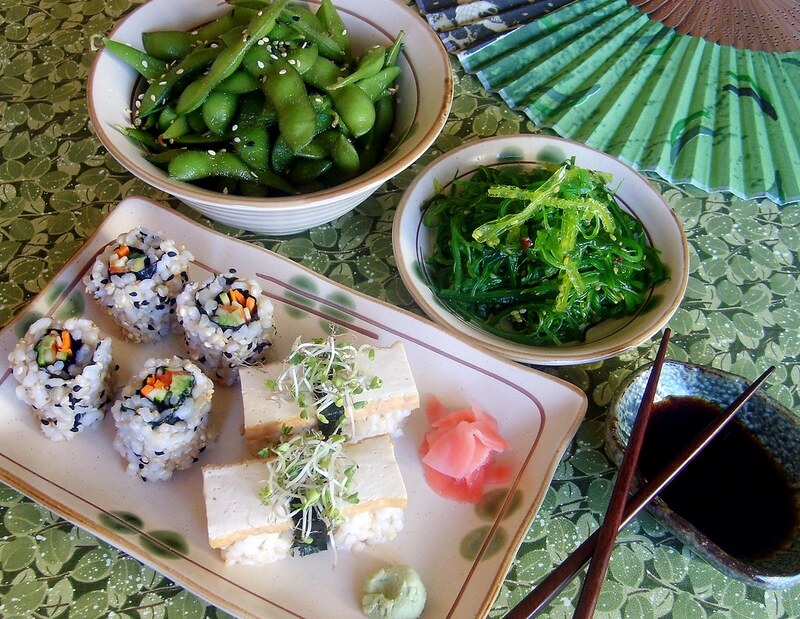 I served my rolls with steamed organic edamame and a wakame (seaweed) salad that I purchased from a local Japanese grocer. If you've never made maki rolls before and you would like to learn how to make them, there are several YouTube videos online that will walk you through each step of the process. For sushi making products or kits, most specialty grocery stores sell bamboo sushi mats, nori sheets, pickled ginger and wasabi--everything you'll need to make delicious and nutritious sushi at home!